Once we have had an opportunity to meet in person our admissions team will provide you with access to our registration form. Once we have received your completed form and the (non-refundable) $150 registration fee your child’s space in the upcoming school year will be guaranteed. 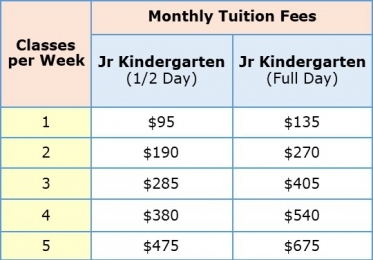 In order to confirm registrations and allow us to plan staffing for each new school year, September tuition fees are due on, or prior to March 15th, and are non-refundable. You can pay the tuition for the whole year by the March 15th deadline, or make a lump sum payment for the remaining 9 months by by September 1, 2019. In addition to your September tuition cheque (due Feb 15th for returning students), post-dated monthly cheques (dated the 1st of each month) for October through June are due by September 1, 2019 for the 2019/2020 school year.